The fish chittnad ($22) at Pappe in Logan Circle is red snapper doused in a flavorful curry. For a meal that will transport your taste buds to another continent, head to Logan Circle. Pappe serves up authentic Indian cuisine in a sleek space located at 1317 14th St. NW. Each menu item blends an abundance of flavors – from chili and garlic to coconut and saffron – that will tantalize your taste buds. But the dish that will leave you ordering seconds is Pappe’s fish chittnad ($22). The fish chittnad is a flavorful entree that features red snapper doused in a curry made from black pepper, red chilies, curry leaves and garlic. On its own, the fish is succulent and tender, practically melting in your mouth. Matched with the curry, the fish chittnad is taken to another level. Each component of the curry comes together to create a bright dish bursting with flavor. Between the black pepper and red chilies, the sauce presents the perfect amount of spice – present, but not overbearing. The garlic spikes the sharpness of the curry, while the curry leaves add a slight nuttiness and also make the dish extremely aromatic. A bed of basmati rice serves as a perfect base to the dish, soaking up the excess curry and mellowing out some of the spiciness. If the rice isn’t enough, order some garlic naan ($3.50) to dip into the extra curry. If you are not a fan of fish, Pappe’s menu is expansive and offers an assortment of Indian fare ranging from butter chicken ($15) and tandoori salmon ($21) to a range of curries like malabar, a coconut curry, and vindaloo, a vinegar and ginger curry, that can be paired with meats like lamb ($16) or shrimp ($18). 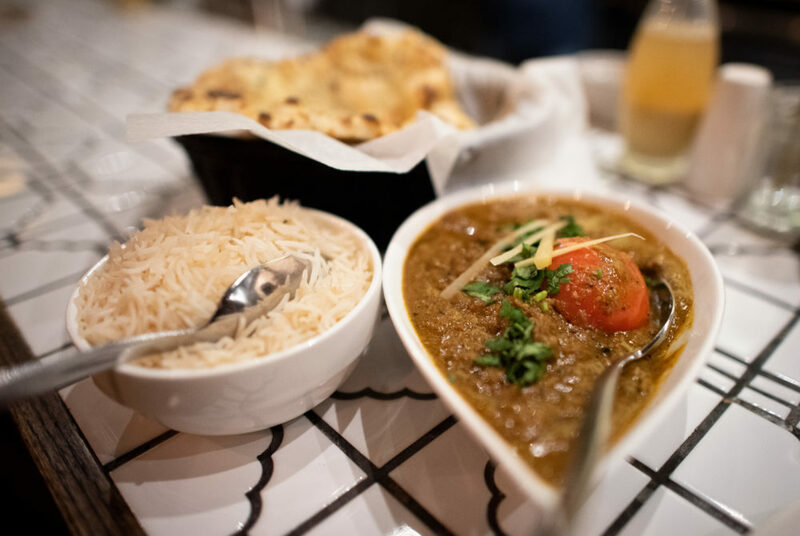 Vegetarians also have a plethora of menu items to choose from like daal fry ($11), a lentil dish with roasted garlic, ginger and cumin, or punjabi aloo gobi ($13) with potatoes, cauliflower, onions and tomatoes in a masala spice blend. The dishes can be paired with a variety of beverages, especially during the restaurant’s daily happy hour from 3 to 7 p.m. Guests can grab $4 beers, $5 glasses of wine and $7 cocktails like the chillintini with chacho – a jalapeno-infused liquor – maraschino, pomegranate and lemon, or the Indian mule with vodka, lime, ginger and black salt. For non-alcoholic options, opt for classic Indian beverages like mango lassi ($4), a popular yogurt-based drink, or a masala chai ($3). Grab a friend or two and explore the modern space, which is fit with exposed brick, colorful tapestries hanging from the ceiling and Indian-inspired drawings on the walls. Then belly up to a booth, table or bar stool for a sampling of hearty Indian classics.